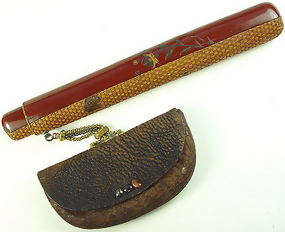 A Japanese pipe case (kizeruzutsu) decorated on a deep red lacquer and lacquered *agiro ground with Chinese bell flowers (kikyo) on one side and a waterlily on the other side. It is attached to a stylish leather pouch with a clasp of mixed metal beans. Some damages on lacquer. Late Edo/Meiji period. *Ajiro is a woven wickerwork made out of strips of bamboo skin, cypress bark or Japanese reed.